In the last two decades, chiropractic medicine has gained credence among the general population by seeking ways to address musculoskeletal issues of pain and pressure, through spinal manipulation. In 2013, Medicare alone paid almost half a billion dollars in chiropractic services in 50 different states. This segment of medicine is said to capture billions of dollars in revenue, thanks to insurance providers who have mainstreamed chiropractic-based pain management along with physical therapy. The incredible speed at which society has accepted chiropractic care as the standard for pain management has resulted in a highly competitive landscape for chiropractic marketing, making it essential for practices to be highly focused and strategic in the selection of marketing tools and platforms aimed at securing additional patients and expanding their market penetration. Yelp for Business: Love it or hate it, every local business needs to be on Yelp. Take time to understand the dos and don’ts of Yelp engagement, and maximize your business opportunities by claiming your profile and managing every review through responding, tracking trends, and utilizing customer feedback to correct operational shortcomings that may be impacting how current and future patients perceive your practice. Chances are you may not need to launch a paid advertisement campaign on Yelp in order to maintain Yelp visibility, but it is highly advisable that you take advantage of every online and offline free tool aimed at creating awareness of your Yelp listing. Facebook: Facebook is the closest you will have to a social network-based word-of-mouth endorsement. Make it a point to maintain an ongoing conversation with your Facebook followers by providing information that adds value, engages, or educates. 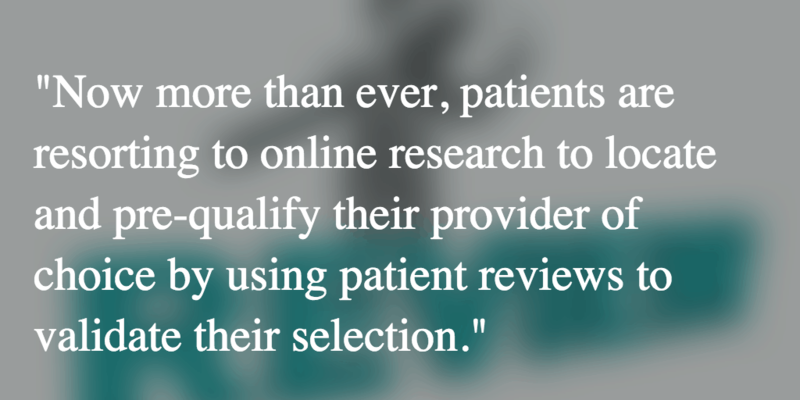 Facebook is not opposed to direct review requests, so encourage your patients to submit their reviews. Facebook reviews in tandem with Facebook’s call-to-action buttons can have a significant impact on your ability to capture social leads. Activate your Facebook reviews and create a welcome and interactive social media environment that encourages your patients to feel like they are an integral part of your brand identity. If you have not yet set up your Facebook profile to be review-friendly, then you can read the ins and outs of capturing customer reviews through Facebook here. Google My Business: Managing every element of your identity on Google is essential to your social media strategy, and a key element for a sound approach to search engine optimization. Signing up for Google My Business and managing your info on Google will give your business significant visibility on the Web, and help new customers find you through geo-location, or based on the IP where their search originates. Capturing new reviews through Google My Business will also automatically activate the rich snippets feature that displays star ratings below your URL. This feature alone will likely increase your click-through count and improve your credibility. Taking every step to ensure you are using every single marketing tool available through Google, specifically those tools that facilitate two-way engagements with your patients, will without question set the stage for success and practice growth. Healthgrades: From all the medical sites available for patient review submission, and those that serve as medical directories, we believe Healthgrades offers the highest potential for marketing and the widest visibility for chiropractic offices. Take time to become familiar with the free and paid marketing options available and don’t delay if you have not yet taken ownership of your Healthgrades profile. In addition to reaching out to potential patients, Healthgrades generates over 100,000 physician referrals; their data-driven search algorithms are especially beneficial for highly specialized practitioners such as chiropractic doctors. Yahoo Local: Recently, Firefox, one of the most popular free browsers, changed their default search engine from Google to Yahoo. With Yahoo as the default search engine for Firefox, making sure that you have a listing on Yahoo Local is a definite must. A free, basic listing gets you ahead of the game, allowing you to include the address, phone number, and site of your chiropractic practice, and making your listing geo-responsive. A LocalWorks by Yahoo paid membership amplifies your reviews by syndicating the content to over fifty different sites. At ReviewTrackers, we are huge advocates of big-picture review management that aims to position businesses in any and all relevant review sites across the Web. The five sites listed above are a great starting point, but don’t leave it at that. Because every lead counts, take time to research which local review sites are the most impactful for your niche in your local market. Establish a basic presence in all niche-appropriate sites, and centralize the monitoring and management of your reviews. Another great post with perfect tips! These are good for any service related business! Chiropraxy has come a long way. Seems like only a decade or two ago many insurance plans wouldn’t cover it. I think they all do now. All five ways or marketing will surely help you promoting your practice. Personally, I like Healthgrades, but I think the best way or promoting is Yelp. Facebook and Google+ are more local, not like Yelp and HG. I never used Yahoo before for promoting, but I will give it a try and let you know about my impressions.